While I've always been fond of Halloween, there's no denying that there is a whole lot of sugar involved in the holiday. Now, as a child, I had no qualms about that. Mo' sugar, mo' betta. But these days, as a mom, if there are ways to make my family's Halloween frightfully delicious while not completely losing sight of nutrition, I'm all for them. Most recently, that quest has been made extremely easy (and tasty) thanks to TruMoo Chocolate Milk and TruMoo Limited Edition Vanilla Milk, which is available in a festive Halloween orange! After being introduced to TruMoo earlier this year, it's easy to say that we've remained fans of the nation's leading ready-to-serve chocolate and vanilla milks. As well as the delectable flavors, TruMoo contains 35% less total sugar than the leading chocolate milk competitor, 40% less added sugar than the previous formulation and no high fructose corn syrup. 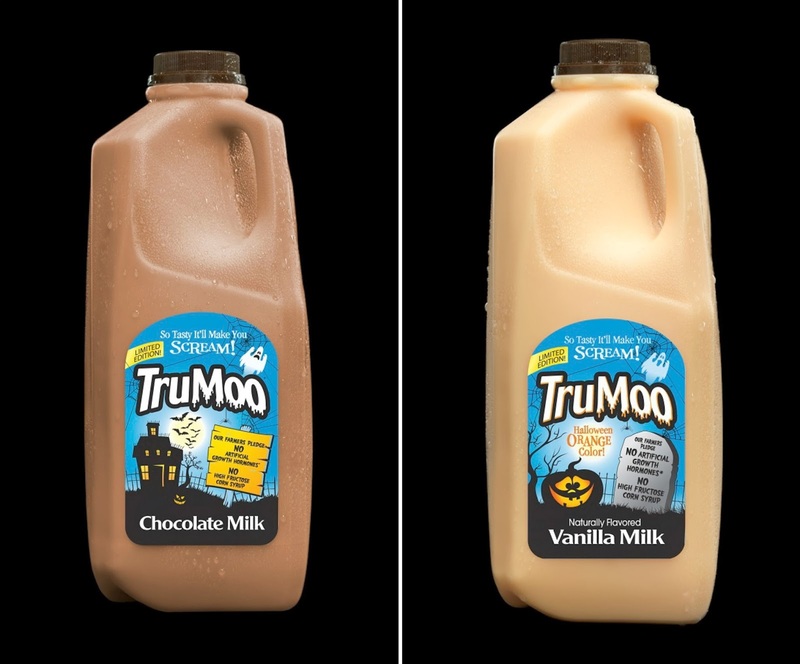 This year for Halloween, TruMoo has come up with a variety of ways to celebrate the spooky holiday. First, the orange-tinted Limited Edition TruMoo Lowfat Vanilla Milk (available at retailers nationwide through the end of October)! I mean, c'mon! Orange milk! Second, the TruMoo Halloween Sweepstakes! Now through October 31st, you will find a unique code located on the cap sticker of specially marked Limited Edition TruMoo Halloween Vanilla and Chocolate milks. These codes can be entered online at TruMoo.com for a chance to win a Haunted Hollywood Vacation trip as well as offering the option to receive $2 off any Goosebumps DVD. 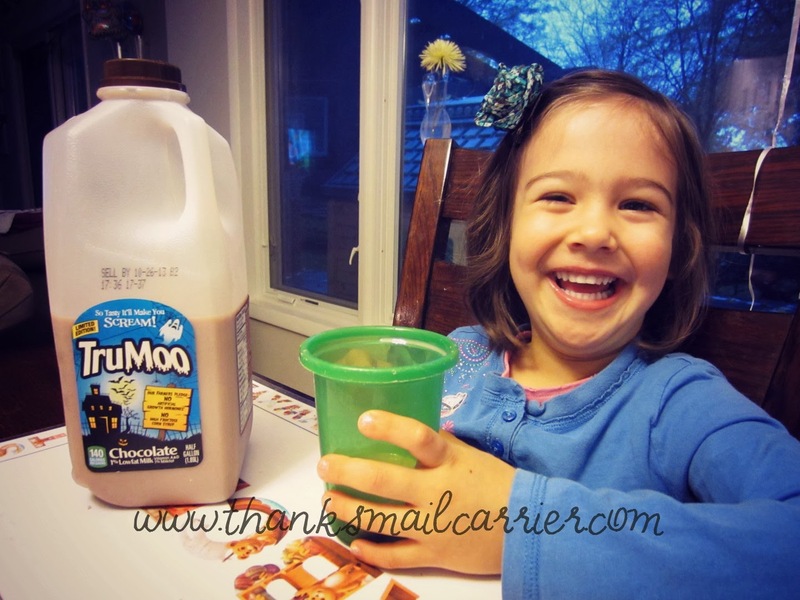 Third, TruMoo has made enjoying their milks even more fun for Halloween. 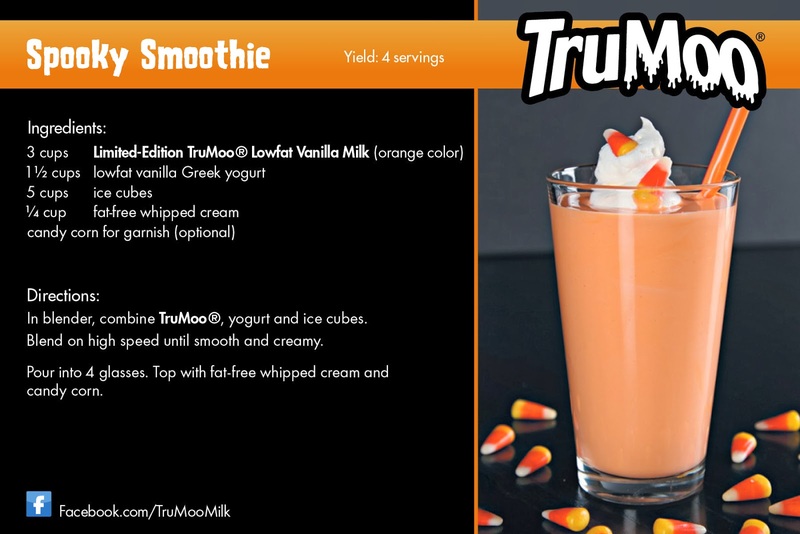 As always, TruMoo can be enjoyed on its own, or, for an added spooky twist, brew up the unique concoctions that they've created, the Spooky Smoothie and the Monster Mash Mudslide. The Spooky Smoothie is a flavorful combination of vanilla milk and Greek yogurt, which is blended with ice and topped with whipped cream. The fun is all in the orange-tinted Limited Edition TruMoo Lowfat Vanilla Milk, so serve it up in a clear glass to get the full effect! Unfortunately, we checked just about every retailer listed on the TruMoo store locator in our areas and the orange-tinted TruMoo was nowhere to be found. Do they not realize that I want a Spooky Smoothie? In blender, combine TruMoo Lowfat Chocolate Milk and chocolate wafer cookies. Blend until smooth. Heat mixture in saucepan or microwave until just heated through (to enjoy a cold mudslide, do not heat in saucepan or microwave). To serve, pour chocolate milk mixture into four glasses. For each serving, spoon a large, upright dollop of whipped topping to resemble a ghost. Insert chocolate chips or chocolate candies into the dollop for eyes. We tried these hot as well as cold and there was no doubt that they were a big hit! For more information about TruMoo's tasty milk varieties (and to enter their awesome sweepstakes), visit TruMoo.com and connect with them on Facebook and Twitter. Keep an eye on the dairy case at your local grocery and convenience stores (TruMoo is also available at Wendy's locations from coast to coast) with a suggested retail price of $4.49 for a gallon, $2.99 for a half gallon and $1.49 for a single serve container. 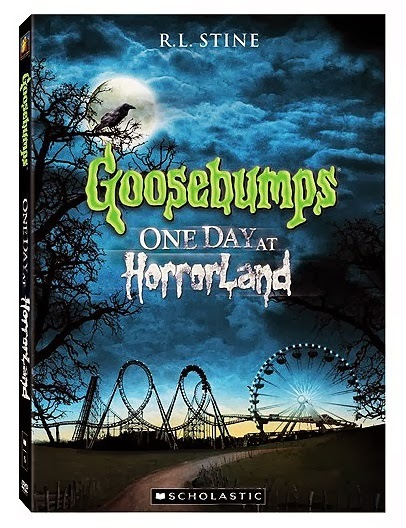 Two lucky people will win Goosebumps One Day At HorrorLand DVDs from TruMoo! A big thank you to TruMoo for providing TruMoo samples and compensation for me as well as DVDs for two lucky giveaway winners. The opinions shared are my own and honest and if you really need to see more, click here to see how I roll. Monster Mash Mudslide for me. The monster mash mudslide sounds good to me! The Monster Mash Mudslide sounds delish! The Monster Mash Mudslide sound delicious! The Monster Mash Mudslide sounds awesome! Thanks so much for the fantastic giveaway! I would try the Spooky Smoothie! I think we would prefer Monster Mash Mudslide! I'd like to try the Monster Mash Mudslide. Thanks. Im a chocolate fan so its the mudslide! Who can resist something called Monster Mash Mudslide? i would choose the monster mash mudslide, thank you! I'd rather try the monster mash mudslide. Hue monster mash mudslide looks the yummiest! I would like to try the Monster Mash Mudslide. The Monster Mash Mudslide is so full of chocolate that when I have my first taste I'll be so overwhelmed with joy. I'll most likely need to have more and save the hot version for evening before bed. Aren't holidays a blast? I want to try the Monster Mash Mudslide first. I think the Monster Mash Mudslide sounds good. Monster Mash Mudslide looks yummy! the monster mash mudslide looks good, thanks for the giveaway. I would try the Monster Mash Mudslide first. While both sound good, I think I would like the Monster Mash Mudslide best. Spooky Smoothie I would try first. I'd like to try the Monster Mash Mudslide first! I would first like to try Monster Mash Mudslide. I would love to try the Monster Mash Mudslide....mmmmm sounds delicious! Oh yeah the mudslide or sure!!! The Spooky Smoothie looks delicious! I'd love to try the Monster Mash Mudslide!! I would try the Spooky Smoothie first although they both sound good. Monster Mash Mudslide all the way!! I would like to try the Spooky Smoothie first. I'm more of a monster mash mud slide guy here! The Monster Mash Mud Slide!! I'd like to try the spooky smoothie. I want to try the Monster Mash Mudslide. I would rather try the Spooky Smoothie first.